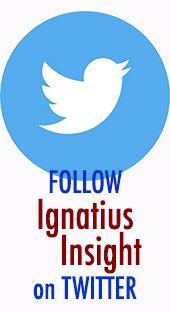 Sign Up Today to Receive the IgnatiusInsight.com Newsletter! The FREE IgnatiusInsight.com newsletter is sent out every week to two weeks. It is filled with information about new articles, interviews, and excerpts at Ignatius Insight, links to recent posts on the Insight Scoop blog, as well as exclusive information about Ignatius Press authors, books, and resources. All information will be kept confidential and will only be used to contact you about IgnatiusInsight.com. It will not be given to or shared with third parties.